Extreme conditions? Bring it on! Epec multipurpose control units are excellent base for embedded machine control systems. All the units have the same robust environmental features but the I/O interface allocation varies according to the product type. The units have an open I/O interface which makes it easy to connect sensors, actuators, joysticks and other devices from most common manufacturers. This makes it relatively easy to optimize the whole control system both in technical and economical way. Epec multipurpose control units have optimized number of both input and output pins to be used in numerous roles in the control system. The total number of I/O pins is 20–65 depending of the product. I/O pins includes digital inputs and outputs, analog inputs, pulse inputs, proportional (PWM) outputs and feedback inputs or upside current measurement. The type of each input is determined by the user application software allowing flexible use of the controller. The controllers are used in very hard environmental conditions (IP67) thus they endures cold, heat, vibration, moisture and impacts easily. This makes the installing also easy as the modules do seldom require any extra protection. All these control units conforms the automotive E17 standards and have a shock endurance up to 100 G.
Gold plated heavy duty AMPSEAL connectors help installing both in machine factory and in the field. Each connector is color coded and mechanically keyed to suit only into the right place. The connector type is specially designed for wire harness use in volume production. In addition to open I/O interface, Epec control units have 1-4 CAN interfaces. CAN interfaces are CANopen compatible and user programmable enabling e.g. 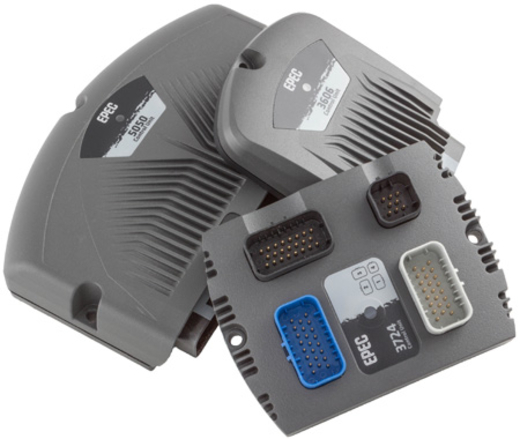 SAE J1939 and Isobus communications also. Controllers are PLCopen programmable which makes the programming work easy and convenient shortening development time for new systems. Codesys programming tool provides with easy graphic environment for developers to work with. For further information about Epec multipurpose control units (Epec 5050 Control unit, Epec 4602 Control Unit, Epec 3724 Control Unit, Epec 3720 Control Unit, Epec 3606 Control Unit, Epec 2024 GL Universal Control Unit, Epec 2023 Control Unit, Epec 2020 Control unit, Epec 2038 Mini Control Unit, Epec 38 CANopen® Slave M1) and other Epec products supporting CANopen and SAE J1939, please visit our website http://www.epec.fi.